Motive can export tracking data in BioVision Hierarchy (BVH) file format. Exported BVH files do not include individual marker data. Instead, a selected skeleton is exported using hierarchical segment relationships. In a BVH file, the 3D location of a primary skeleton segment (Hips) is exported, and data on subsequent segments are recorded by using joint angles and segment parameters. Only one skeleton is exported for each BVH file, and it contains the fundamental skeleton definition that is required for characterizing the skeleton in other pipelines. 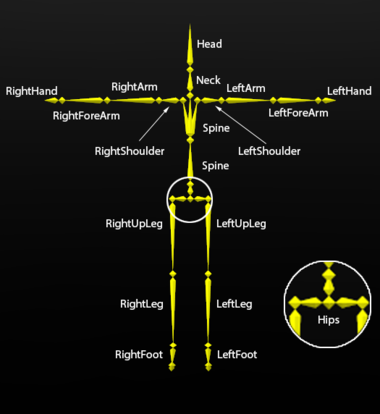 Notes on relative joint angles generated in Motive: Joint angles generated and exported from Motive are intended for basic visualization purposes only and should not be used for any type of biomechanical or clinical analysis. Single Joint Torso When this is set to true, there will be only one skeleton segment for the torso. When set to false, there will be extra joints on the torso, above the hip segment. Hands Downward Sets the exported skeleton base pose to use hands facing downward. 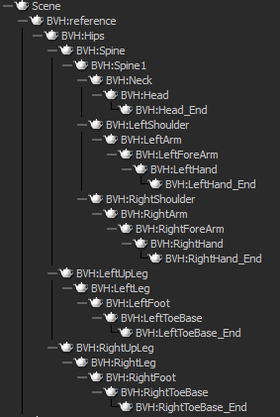 MotionBuilder Names Sets the name of each skeletal segment according to the bone naming convention used in MotionBuilder. Skeleton Set this to the name of the skeleton to be exported. Units Sets the length units to use for exported data. Scale Apply scaling to the exported positional tracking data. This page was last modified on 26 July 2018, at 09:08.